It’s Tax time! Tips to get you ready now. 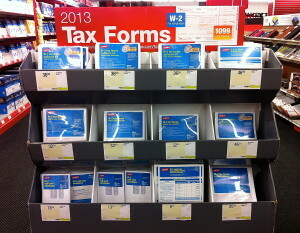 Home » Blog » Blog » It’s Tax time! Tips to get you ready now. Yes, I know January just began, but it’s already tax time. For many businesses 1099’s are due to independent contractors by January 31st and that deadline will be here soon. Check here to determine who should receive a Form 1099. In my quest to find more information about tax time, I decided to interview my friend Aaron Smyle, of Smyle and Associates, LLC, a tax, compliance, and financial planning firm based in New York City. Please check out Aaron’s website for more info. Taxes and finances are very personal topics, please consult your own accountant/specialist for information directly related to you and your business. a simplified life: How can individuals and small businesses prepare for their 2014 tax returns or 1099’s? Aaron Smyle: For small businesses, the best approach in terms of readiness for the upcoming tax season is one of pro-activeness as opposed to re-activeness. It is more efficient and effective if the financial statements (balance sheet and profit and loss) are prepared on a monthly basis. You are not only prepared to discuss the year end numbers but you also have the ability to make any required yearend adjustments or take advantage of expiring tax incentives. If you were unable to keep up with a monthly schedule, the necessary information (bank statements, invoices, bills, etc) should be organized in the best possible manner. If you are an individual, having a folder for all tax related information that is kept in the same place year after year will help you have everything that you need come tax season. Having a yearend discussion with your accountant will also help you prepare, as you will be on the lookout for the required information. It will also determine if there will be a tax liability at the end of the year in order to devise the appropriate plan to pay for the taxes. a simplified life: What paperwork is vital for clients to have in order to maximize their time with their accountant? Aaron Smyle: When meeting with your accountant, it is important to bring the proper paperwork. There are many documents that are tax related, such as Forms W-2, 1099, 1098, and K-1 that should be brought in. 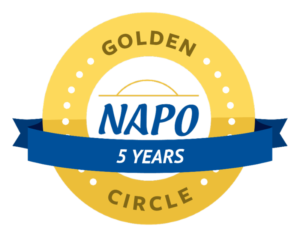 During the meeting, you will discuss any changes in income or family situations from the previous year, which may cause the need for additional paperwork to be delivered. a simplified life: How can individuals be more productive and make things easier for themselves and their accountant? Aaron Smyle: The better organized your information is, the better your accountant will be able to prepare your return. If you have a box full of receipts, it would be beneficial to go through them and create a spreadsheet with the appropriate categories and amounts before handing them off. a simplified life: What top 3 things can you suggest for individuals to stay organized and reduce stress during tax time? Aaron Smyle: Tax time is both stressful for the client and the accountant. The top three things you can do to stay organized and to reduce stress are (1) keep all tax related documents in one place; (2) get filed early; and (3) do not try to do it yourself. a simplified life: When is the best time to make your tax appointment for 2014? Aaron Smyle: Calling your accountant early in the tax season is more advisable then waiting until the last minute. As soon as you feel you have most of your information, you should make an appointment. There will usually be follow up questions and open items that need to be answered and the turnaround time needs to be factored into the completion of the returns. a simplified life: What advice can you give on choosing the right accountant? What quality should you look for in your search? Aaron Smyle: Choosing the right accountant is an important decision and one that must be done in a thoughtful manner. It is important to find a professional that you trust as finances are extremely personal in nature. Education and responsiveness are areas in which you should look to receive as well as the expectation to tell you what you need to hear, as opposed to what you want to hear. Going off of a recommendation and scheduling a face-to-face meeting is also beneficial in order to build a stronger level of trust. a simplified life: Thank you for all this useful information Aaron. Finally, can you briefly give deadlines for tax time for 2014? The IRS expects to start processing 2013 individual tax returns (IR-2013-100). Deadline for employers to mail out Form W-2 to employees and for businesses to furnish Form 1099 statements reporting, among other things, non-employee compensation, bank interest, dividends, and distributions from a retirement plan. Deadline for businesses to mail Forms 1099 and 1096 with the IRS if filing on paper. If filing these forms electronically, the deadline is April 1. Deadline to file individual tax returns (Form 1040, 1040A, or 1040EZ) for the year 2013 or to request an Automatic Extension (Form 4868). An extension provides an extra six months to file your return. Payment of the tax is still due by April 15th. You can submit payment for tax along with the extension form. 1st quarter estimated tax payments due for the 2014 tax year. Deadline to file Foreign Bank Account Report for the year 2013. This report is required if you have over $10,000 (in aggregate) held in foreign bank accounts. Foreign Bank Account Reports have a new form number (FinCEN Form 114) and must be filed electronically. Extensions of time to file are not available. 3rd quarter estimated tax payments due for the 2014 tax year. Final deadline to file corporate tax returns for the year 2013 if an extension was requested. (Forms 1120, 1120A, 1120S). Final deadline to file trust income tax returns (Form 1041) for the year 2013 if an extension was requested. Final deadline to file partnership tax returns (Form 1065) for the year 2013 if an extension was requested. Last day the IRS will accept an electronically filed tax return for the year 2013. If filing after October 15th, you’ll need to mail in your tax return for processing. Final deadline to fund a SEP-IRA or solo 401(k) for tax year 2013 if you requested an automatic extension of time to file. Start planning any year-end tax moves. Last day to make any tax moves for the year 2014. Last day to set up a solo 401(k) for self-employed persons. Marital status on this date determines your marital status for the whole year. I just spent time this weekend organizing my 2013 files and creating new files for 2014. This year I picked yellow as my folder-color of choice. I made hanging files for the general categories and additional file folders for more specific items. I use a simple black portable file tote to contain my current files and a Watertight File Box (from The Container Store) to store my older documents. 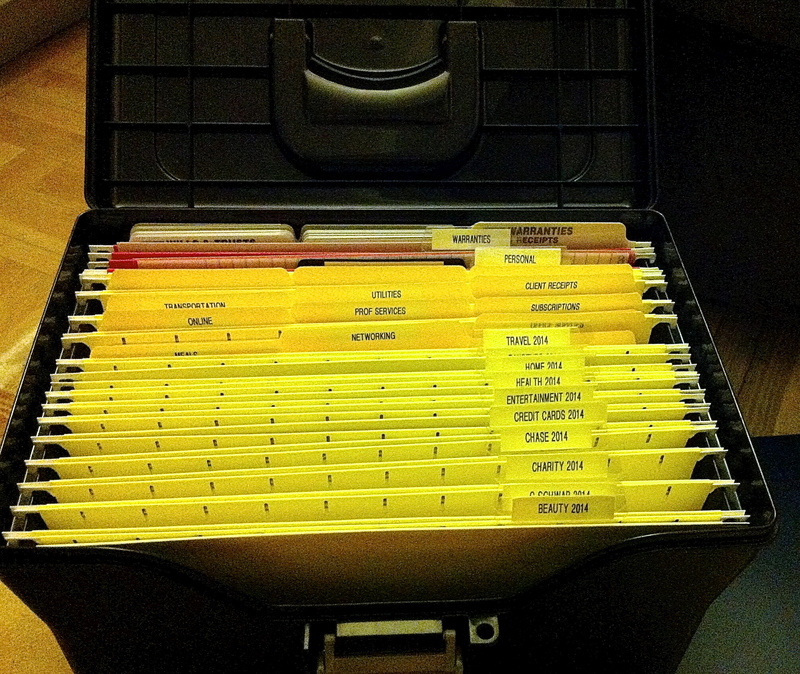 I don’t have to do additional work as I just transfer the hanging folder over from the tote to the file box. I hope this information was helpful. 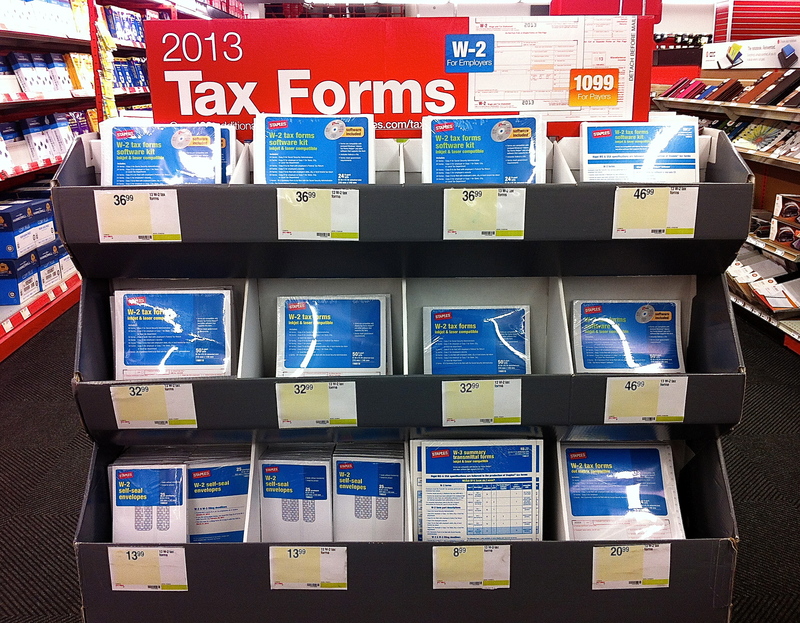 Please leave comments and thoughts below and let me know how prepared you are to file your 2013 taxes?